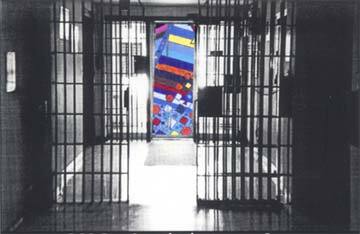 The artwork in Cellblock Visions was made behind bars between 1983 and 2011, much of it in an era that was a relatively golden age of creative opportunities for prisoners - the goal was actually rehabilitation - a word you don’t hear much these days. I discussed this matter with a convict I know and he was incredulous. "Rehabilitation? Are you joking? That’s the last thing in the world they want! It would ruin the economy!" "They want us idle"- said another man, after his art supplies were confiscated, "so we’ll get in trouble - so they can keep us here." Popular sentiment has it that imprisonment must not only be long, it must be harsh - severely restrictive - routinely degrading - chain gangs and rock-busting. Many correctional institutions are chipping away daily at the so-called "amenities" of prison life; television, radio, coffee-maker, colored pencils. More and more gates to sanity are being slammed shut. It is possible to exact justice without vengeance. Vengeance does not heal - not us, not them. It is common sense to help people to re-enter society in better shape than they were when they came to prison. Experiences of dignity and creativity can contribute to that goal. We want them to be wiser, calmer, humbly self-confident, with skills for practical survival within the law - and the inclination to make a positive contribution. "When power leads man toward arrogance, poetry reminds him of his limitations. When power narrows the area’s of man’s concern, poetry reminds him of the richness and diversity of his existence. When power corrupts, poetry cleanses. For art establishes the basic human truths which must serve as the touchstone of our judgement."